Used car sales start to rise | What Car? 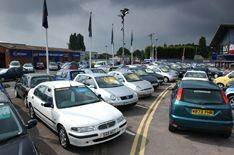 Used car sales are rising as buyers take advantage of low prices, according to new research and auction results. Sharp rises in vehicle depreciation and slow sales have pushed down used car prices in recent months, according to research by industry analysts EurotaxGlass, but the bargain prices are now tempting buyers. 'The good news for consumers is that the falls in trade values are being translated into lower asking prices on the forecourt, and there have been clear signs over recent weeks that retail demand has improved as a result,' said Adrian Rushmore, EurotaxGlass's managing editor. Research showed that compact MPVs such as the Citroen Picasso and Renault Scenic, have fared worst from the rapid rise in rates of depreciation. Trade values of three-year-old, petrol-powered models are down by 31%, compared to identical cars of the same age at the start of 2007. Car supermarkets across the country have been reporting strong sales in recent weeks, with keen-eyed customers snapping up well-priced cars quickly. The country's leading auction houses have also notice an upturn in sales since Christmas and there appears to be a scramble for good condition vehicles offering the best value. British Car Action latest report shows that average used car values rose by 300 in January compared with December. At the same time the average age and mileage of used cars fell slightly to four years, three months and 52,500 miles. What Car? 's used car editor, Matt Sanger, is not surprised with the news: 'It's taken most buyers a while to wake up to the fact that there are some stunning used bargains out there especially the types of cars that have suffered big value drops in the last few months. Large SUVs, performance cars, large MPV and even family cars are all looking like a great buy. If you've got the money there are savings to be made.